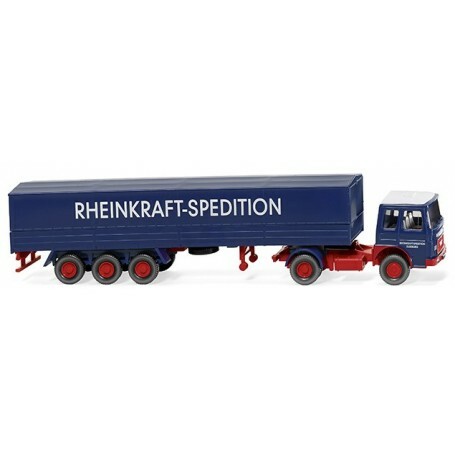  Flatbed tractor-trailer (MAN) "Rheinkraft Spedition"
Flatbed tractor-trailer (MAN) "Rheinkraft Spedition"
Flatbed tractor-trailer (MAN) 'Rheinkraft Spedition'. Tractor unit: driver's cab sapphire blue, engine with lower plate and grille without Büssing lion traffic red. Interior light grey, chassis and wheel rims traffic red. Rear fender sapphire blue. Grille imprinted with MAN logo, Diesel lettering and frame imprinted silver. Side fender and bumper painted traffic red, roof imprinted white. Front silver air slits and white 'Rheinkraft-Spedition' lettering. Side also imprinted with 'Rheinkraft-Spedition' lettering and additional 'Duisburg'. Front headlamps hand-painted. Flatbed trailer and tarp sapphire blue with silver cardboard insert. Trailer chassis, support rollers and wheel rims traffic red. Triple fender sapphire blue. Side of tarp imprinted with white 'Rheinkraft-Spedition' lettering, white Thyssen logo on rear.